Cryogenic Equipment Market size is set to exceed USD 25 billion by 2024; as reported in the latest study by Global Market Insights, Inc. Ongoing investments for the expansion of existing manufacturing facilities along with introduction of GHG emission reduction targets leading to an increased use of natural gas will positively influence the cryogenic equipment market growth. Furthermore, rising number of projects of clean coal & gas to liquids as well as integrated gasification combined cycle will further complement the business landscape. The U.S. cryogenic equipment market is predicted to exceed USD 4 million by 2024. Increasing industrial natural gas consumption coupled with sizeable investments in new E&P ventures will fuel the industry growth. As per the Energy Information Administration, in 2017, the U.S. witnessed consumption of 7.9 million cubic feet of natural gas across the industrial sector. Moreover, increasing natural gas liquefaction capacity in the country will stimulate the business growth. Nitrogen based cryogenic equipment market size will grow on account of the product’s wide-ranging applications across oil & gas operations including injection & pressure testing, EOR, reservoir pressure maintenance, well stimulation, nitrogen floods and inert gas lift. Furthermore, the predominant use of the gas during plant maintenance shutdown and start-up preparations of refineries and petrochemical industries will stimulate the business growth. Healthcare cryogenic equipment market will witness strong growth owing to the ongoing investments toward renovation and modernization of existing hospitals along with improving service portfolio. In the U.S., healthcare spending witnessed a substantial growth of 17% from 2013 to 2016 amounting for around USD 3 trillion. Rising investment across power generation sector coupled with inclination toward electricity production from natural gas to cut carbon footprint will augment the cryogenic equipment market size. In 2015, the U.S. and Mexico generated around 32% and 60% of the total electricity from natural gas sources respectively. Cryopump market size is predicted to expand over 7% by 2024. The development of wide-ranging product designs including bath cryopumps, supercritical helium-cooled, refrigerator-cooled, and novel cryogenic pump to meet the customer requirements across different sectors will drive the product demand. In addition, rising investments across oil & gas and electricity sectors coupled with increased application of liquefied gases across healthcare facilities will complement the business landscape. Natural Gas (NG) based cryogenic equipment market size will grow on account of the product’s ability to produce several other industrial gases including hydrogen, helium, and methane to meet the rising energy demand. As per the International Energy Agency, the global demand for NG could rise by more than half by 2040 on account of its usage as a feedstock for various other industries. 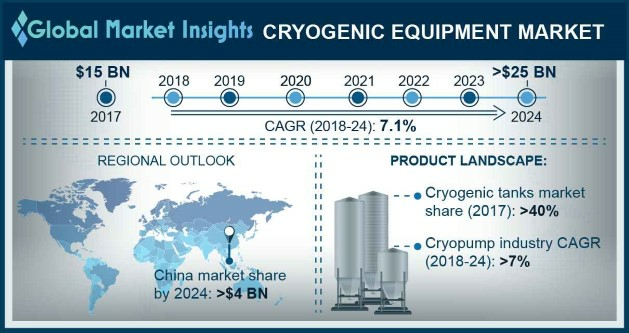 Key players in the cryogenic equipment market include Chart Industries, INOXCVA, Emerson Electric, Cryostar, Linde Group, Wessington Cryogenics, Praxair Technology, Air Products and Chemicals, Air Liquide, Graham Partners, Ebara, Technifab Products, and Nikisso Cryo.